On the central Anatolian plateau which forms the heartland of Turkey: ochre-hued, cleft by ravines and dominated by volcanic peaks. Ankara is the capital of Turkey and the country's second largest city after İstanbul. The city has a population around 4.5 million, it goes up to 5.5 million including the provinces. The city of Ankara lies in the center of Anatolia on the eastern edge of the great, high Anatolian Plateau, at an altitude of 850 meters (2800 ft). The province is a predominantly fertile wheat steppe land, with forested areas in the northeast. It is bordered by the provinces of Çankırı and Bolu to the north, Eskişehir to the west, Konya and Aksaray to the south, and Kırıkkale and Kırşehir to the east. Centrally located in Anatolia, Ankara is an important commercial and industrial city. It is the center of the Turkish Government, and houses all foreign embassies. It is an important crossroads of trade, strategically located at the center of Turkey's highway and railway networks, and serves as the marketing center for the surrounding agricultural area. The city was famous for its long-haired Angora goat and its prized wool (mohair), a unique breed of cat (Angora cat), white rabbits and their prized wool (Angora wool), pears, honey, and the region's muscat grapes. History of a city: "Cross road of civilizations: Ankara"
It was formerly known as Angora. The Hittites gave it the name Ankuwash before 1200 BC, the Galatians and Romans called it Ancyra, and in the classical, Hellenistic, and Byzantine periods it was known as Ἄγκυρα Ánkyra. Ankara also serves as the capital of the Province of Ankara. The region's history goes back to the Bronze Age Hatti civilization, which was succeeded in the 2nd millennium B.C by the Hittites, in the 10 th century B.C by the Phrygians, then by the Lydians and Persians. 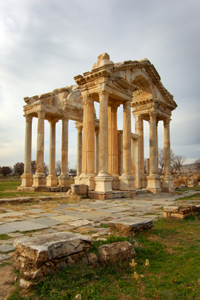 After these came the Galatians,.a Celtic race who were the first to make Ankara their capital in the 3rd century B.C It was then known as Ancyra, meaning "anchor," one of the oldest words in the language of the sea-loving Celts. The city subsequently fell to the Romans, and to the Byzantines. Seljuk Sultan Alparslan opened the door into Anatolia for theTurks at the victory of Malazgirt in 1071. Then in 1073, he annexed Ankara, an important locatian for military transportatian and natural resources, to Turkish territory. 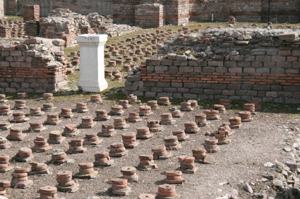 The city was an important cultural, trading, and arts center in Roman times, and an important trading center on the caravan route to the east in Ottoman times. It had declined in importance by the nineteenth century. It again became an important center when Kemal Atatürk chose it as the base from which to direct the War of Liberation. By consequence of its role in the war and its strategic position, it was declared the capitalaf the new Republic of Turkey on October 13th, 1923. This plateau was also a cradle of human civilization. At Çatalhöyük, remains of settlements as old as the eighth millennium B.C. have been unearthed. Here in the homeland of many civilizations and the historic battle­ground between East and West, the Hatti's, Hittites, Phrygians, Galatians, Romans, Byzantines, Seljuk's and Ottomans all fought for their sovereignty and established their rule. In the 11th century, migrating Turks from the east made the plateau their own. During its turbulent history, Central Anatolia has endured invasion by great con­querors, such as Alexander the Great and Tamerlane. In the course of ten millennia of habitation, the denizens of the area have reflected in their art the dramatic contours of the surrounding landscape, from the vig­orous paintings of Çatalhöyük and the confident lines of Seljuk architecture, to, more recently, the impressive modern form of Atatürk's mausoleum.